In a large bowl, mix together the flour, sugar, salt, baking powder and cinnamon using a whisk. In another bowl, whisk together the cooled melted butter, eggs, milk, and vanilla. Combine the wet ingredients and dry ingredients, then stir until the batter just comes together (do not over mix). 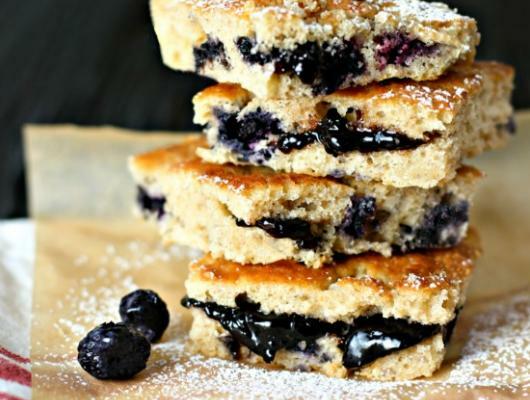 Mix in ½ cup of blueberries until just mixed in. Pour the batter onto the sheet pan and smooth it into an even layer with your spatula. You don't have to take it all the way to the edges, just enough to keep it in a thin layer (about ½” high). Place the blueberries onto one-third of the batter, the strawberries onto another third, and finally the banana slices drizzled with caramel over the last third. Sprinkle the top of the batter with turbinado sugar and bake about 20 minutes, or just until the edges are turning golden brown. Remove from the oven, let cool for at least 10 minutes, then slice into squares. 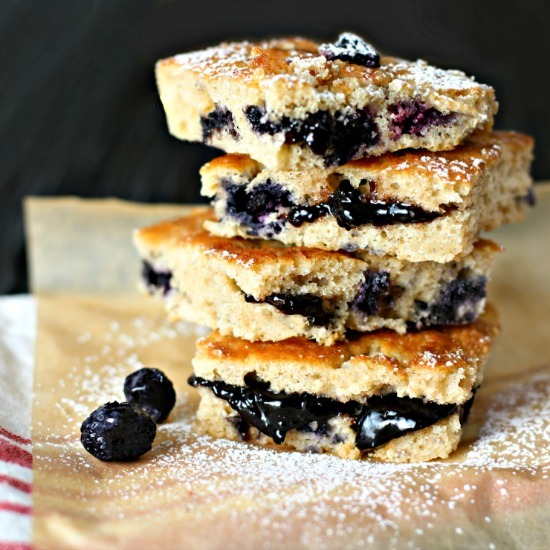 You won’t need any muffin top pans for these quick and easy Sheet Pan Blueberry Muffin Tops. You use a baking sheet to get the best part of these scrumptiously moist breakfast muffins that are bursting with blueberries, have golden crispy edges and a sparkling sugar, buttery crust!